December 5, 2013: Today at the international body meeting, IndustriALL Executive Committee members unanimously approved a petition condemning Samsung Electronics for union busting policy. Samsung Electronics, one of the biggest IT corporations of the world has a long history of disrespect towards labour and human rights. 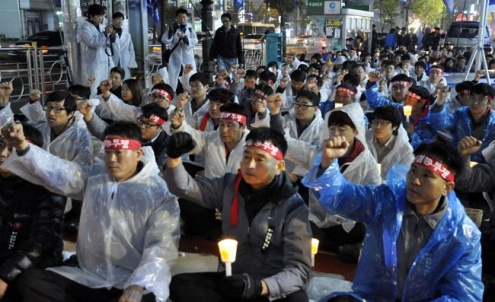 The Korean Metal Workers’ Union, an IndustriALL affiliate, raised the issue citing numerous cases of violations of workers’ rights ranging from kidnapping and battening of union leaders up to a special training delivered by the company to its management with the specific aim of implementation of an effective “union-free” policy not only in Korea itself but also in other countries of the region. The well-known global IT producer is also notorious for poor working conditions including long-working hours and largely using a precariously employed workforce. At the same time the company tries to prevent workers from joining trade unions disabling them from fighting for better conditions. Not only does Samsung do everything to prevent workers from joining trade unions, the company also makes pressure on unionized precariously employed workers forcing them to withdraw from their representative organizations. The pressure including discrimination in payment based on union membership as well as continuous targeted auditing of union members is very high. 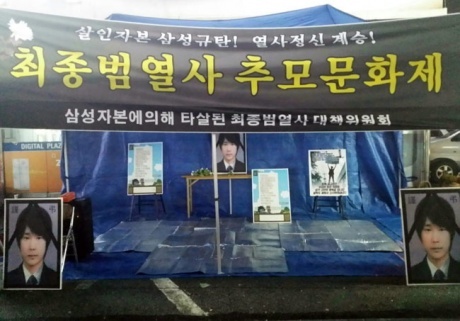 The resolution reveals the case of Jong-Beom Choi, Samsung Electronics Service Local union member, who was pushed into extreme hardship through such targeted auditing and committed suicide on 31 October 2013 in protest of Samsung union repression. Tomorrow, on 6 December 2013, KMWU representatives are submitting a complaint against Samsung with the Committee on Freedom of Association of the International Labour Organization. 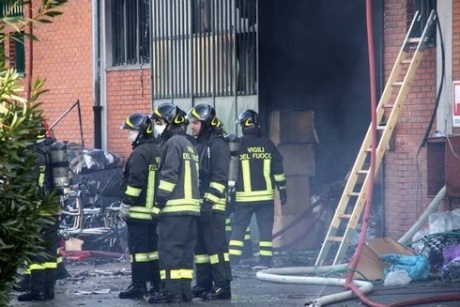 December 5, 2013: At least seven migrant garment workers of Chinese origin died and three were injured in the blaze on 1 December 2013 in an industrial zone of the town of Prato in Tuscany region of Italy. 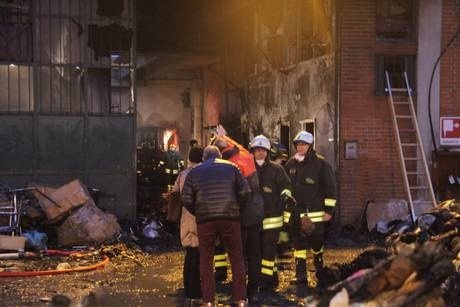 The fire happened on Sunday morning in a warehouse of a textile factory, on top of which according to local mass media reports there was an improvised dormitory made of small cardboard compartments where 11 workers slept. 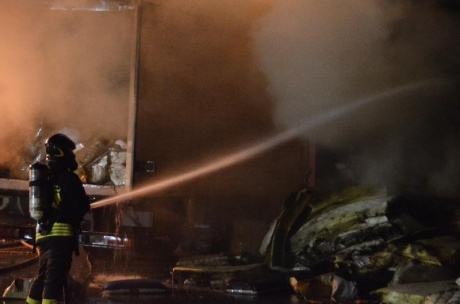 The victims were reportedly Chinese immigrants. Over recent years once one of the biggest textile dominated the industrial zone of Macrolotto where the tragedy happened has seen the biggest decline since World War Two. Likewise in many other industrialized countries in the search for bigger profit many textile companies moved from Italy to countries with less protected and lower paid workforce. However, that was not the end of textile industry in Macrolotto zone. In fact the zone saw a new development, and for some years many Chinese companies come there. Producing in Italy makes part of the branding and is an added value to the final product. Currently there are more than 4,500 companies leading commercial activities in the zone. These companies employ some 30,000 legal migrants of Chinese origin and an unclear number of illegal migrants working and living in precarious conditions similar to the ones resulted in death of the workers. According to the IndustriALL Italian affiliate FEMCA-CISL, the union representing textile and garment workers, these companies are characterized by a high turnover, non-respect of national norms, in addition they often close down their operations in a very short period of time, thus preventing any possible trace down of their operations. Their final market also remains oblique. Recently the union noticed that these companies started to appear also in other sectors. FEMCA is working in two directions, by representing the interests of workers independently of their origin and stimulating a rising of culture of legality and integration. However the closures blocking legal denunciations and blackmailing against workers bring all efforts to nought. The union believes a more comprehensive approach is needed including setting up a special institutional body able to do better monitoring and coordination of enforcement actions including through strengthened public bodies. In addition the union believes the authorities should support the companies operating legally with respect to the rules of work and dignity. If measures are not taken now the union considers the new tragedy will be just a question of time. December 5, 2013: The IndustriALL Global Union Executive Committee meeting on 4-5 December 2013, committed to rally behind key urgent struggles of affiliates in Ansell Sri Lanka, Samsung Korea, Bangladesh, MENA, and Mexico. ExCo also supported a reorientation of the International to increase focus on strategic campaigns and organising. Meeting at the International Labour Organisation in Geneva, the ExCo was an historic occasion due to the participation of one very important delegate, details of which can only be published tomorrow. Permanent action continues to fight precarious work, as a key flagship IndustriALL campaign. President Huber described precarious work as the “Modern form of slavery, especially affecting young people”. “We should be helping our affiliates as much as possible so that they can operate in their regions. IndustriALL must prioritise organising. Only from a strong base can unions defend workers. IndustriALL must use its strength and power to confront companies and governments who trample upon workers’ rights. In Colombia, Mexico and Iraq we must continue our fight for workers’ fundamental rights. Structural unemployment remains high, there is growing economic and social inequality in all regions. The IndustriALL Executive Committee assessed work conducted in Bangladesh since the Rana Plaza tragedy, following the report from the general secretary Jyrki Raina and assistant general secretary Monika Kemperle. The Accord for Fire and Building Safety in Bangladesh driven by IndustriALL and UNI was commended as a breakthrough. Now signed by 118 companies, covering 1,800 factories and 2 million workers. Negotiations continue towards a compensation agreement for Rana Plaza victims. IndustriALL’s action in the Middle East and North Africa (MENA) was outlined by assistant general secretary Kemal Özkan, announcing a new target project for Iraq, Egypt and other countries in the region. The MENA region continues as a priority hotbed for IndustriALL. Challenges continue in Egypt where there are now two independent trade union structures, but lacking operational activities and a culture of dialogue with the government needs to be built. The situation is better in Tunisia; trade union UGTT has played a central role throughout the country’s transformational process. In Iraq the international campaign for a fair labour legislation continues. Assistant general secretary Fernando Lopes updated the ExCo on the ongoing campaign for trade union rights in Mexico. Delegates rallied behind the urgent “No to Dirty Ansell Gloves” campaign, following an update from ExCo member Anton Marcus, the head of the Sri Lankan union fighting for its members locked out by the intransigent Ansell. See the Ansell resolution here. ExCo equally pledged full support behind a resolution condemning union busting by Korean-based Samsung Electronics. See the full article here. ExCo also discussed the Rio Tinto corporate campaign that will focus on increasing union density, organising workers, and getting recognition of IndustriALL as the company’s formal negotiating counterpart. Four major spotlights of the campaign immediately are Mongolia, Indonesia, Madagascar, and Australia. The International’s Executive adopted newly structured central goals and key strategies for the period until the 2016 Congress. ExCo endorsed a new process to move IndustriALL from the set-up phase to an action–oriented consolidation phase that builds union power around the world focusing on organising and growth. ExCo also adopted a new charter of principles in confronting corporate violations of fundamental rights. 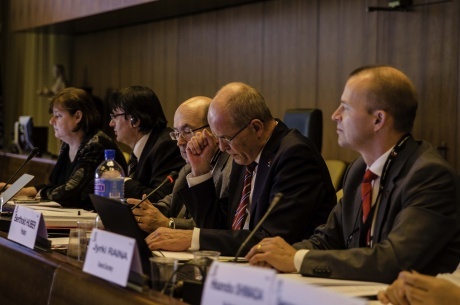 December 5, 2013: The second issue of IndustriALL Global Union’s journal, “Global Worker”, was launched this week at the 4-5 December IndustriALL Executive Committee meeting in Geneva. Sign up to receive copies of the journal or view online. IndustriALL continues to support the development of free and independent trade unions in the Middle East and North Africa (MENA). 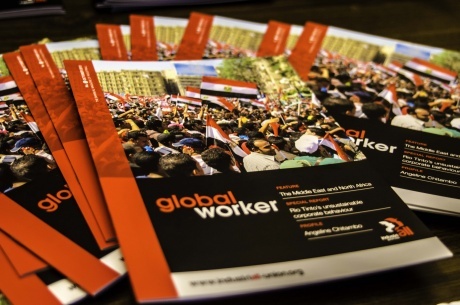 Over a year after the Arab Spring IndustriALL presents an in-depth feature in this edition of the Global Worker on this priority region. The feature includes an overview of cases in Palestine, Lebanon, Egypt, Tunisia, Morocco, Algeria and Somalia as the struggle continues in the MENA. A special report on Rio Tinto’s unsustainable corporate behaviour, exposes the human and trade union rights abuses that are taking place in Rio Tinto’s operations globally. IndustriALL interviewed Marcio Pochmann, an economist, researcher and professor at UNICAMP (Campinas University) on industrial policies and it’s importance in Latin America and the Caribbean. The magazine also includes a profile of Angeline Chitambo of the Zimbabwe Energy Workers Union (ZEWU) as she fights on in the face of violations by the state owned Zimbabwe Electricity Supply Authority (ZESA). There are also profiles of The Trade Union of Metallurgy Mining and Chemical Industry Workers of Georgia (TUMMCIWG) and the newly formed UNIFOR in Canada. 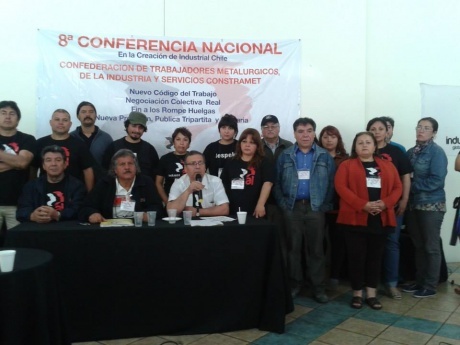 December 3,2013: At the eighth national conference of the Chilean metalworkers’ confederation (CONSTRAMET) on 21-23 November, delegates made progress in discussions on the organization of a new national industrial union. This was a significant step forward in the task of creating a union that will negotiate at sector level and cover all manufacturing and extractive industries where Industriall represents workers at the global level. The conference opened at the offices of the Chilean central union CUT and was attended by the CUT president, Bárbara Figueroa, who described CONSTRAMET’s work in promoting unity and strengthening the union as visionary. At the opening of the conference Marino Vani, IndustriALL Global Union Assistant Regional Representative, who attended the entire conference, congratulated CONSTRAMET for its work on the four-year project to strengthen the union. He highlighted the need to organize outsourced and non-unionized workers and to increase trade union membership and the number of workers covered by collective employment contracts. 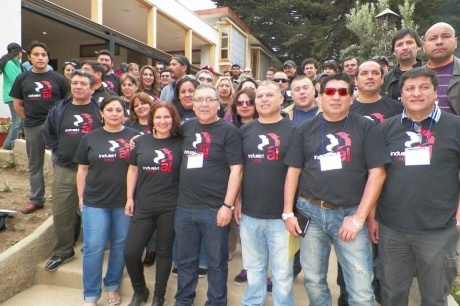 The conference formed part of a trade union strengthening programme in Chile aimed at building a new trade union structure and developing new collective bargaining strategies, a process that is being spearheaded by CONSTRAMET, an IndustriALL affiliate. The project aims to strengthen the trade union movement by merging manufacturing industry unions in Chile. The union’s eighth conference was attended by 135 leaders from 67 CONSTRAMET affiliates in all areas of the country and aimed to create the conditions and make the changes necessary to create a new trade union structure and develop collective bargaining at sector, sub-sector, geographical and holding company levels. The second day of the conference was held at Mantagua, 149 km from the Chilean capital, where working groups discussed the statutes and structure of the new organization. Delegates met again in plenary on 23 November to finalize the conference’s conclusions. The new union will have nine departments, including ones for retail, women, youth, metalworking, mining, chemicals, forestry and textiles and will be organized on an area and regional basis (North based in Antofagasta; South in Concepción). Approval of the union’s principles and objectives. CONSTRAMET said it will draft a work plan in January 2014, focusing mainly on developing coordination with other industrial organizations, including the Private Sector Federation (Federación de la Minería Privada), Unionisation Mining Confederation (Confederación Minera de Sindicalización), FTC, Mining Contractors (Contratista de la Minería) and all those who want to be part of the new national union. The union added that it will circulate the conference resolutions and that these resolutions made provision for ratification of the creation of the national union and its organization during 2014 in most towns where the main industries are located.